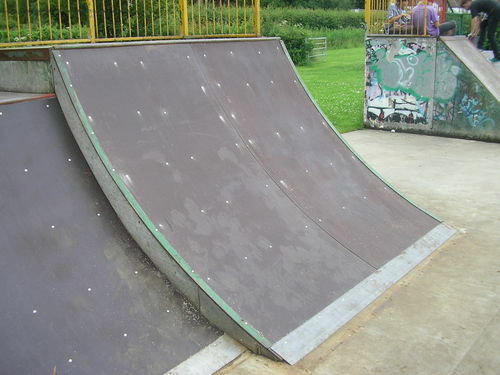 The skatepark has now been open for 7 years. 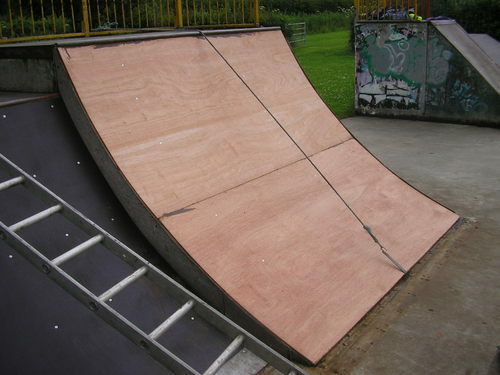 Our choice of materials means that there are still some original surfaces, so the Phenolic Resin coated ply outlasts proprietary skate park surfaces and ordinary ply by a considerable amount. 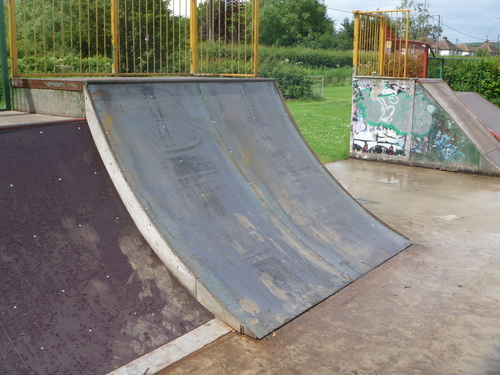 But we have had problems: We have always had a problem with water laying on the park, this gets "wicked up" into the underply, which eventually rots, and so the surface layer doesn't have the support it needs. We have also found that when replacing top surface ply that it is difficult to drill accurately into the 2" wide support bars, and you often hit an old screw, which destroys the drill. My first recommendation would be to increase those support bars from 2" to 3", but have recently come up with a better idea: instead of using 6mm ply for the base layer, I am now experimenting with 2.5mm mild steel sheet. 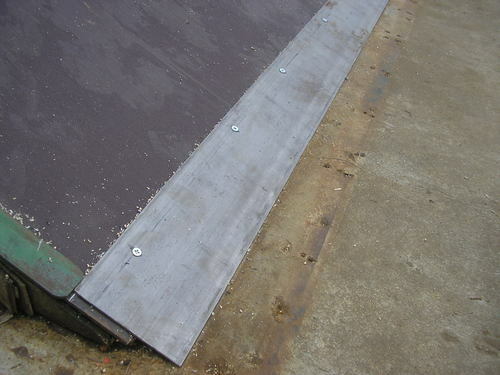 This is about twice the cost of good quality ply, but should last years longer, gives better support to the ply surface, and also means that wherever you drill you will find steel to anchor the self tapping screws holding down the ply surface. This picture shows a jump stripped for resurfacing. Then just screw the two sheets of 8x4 6mm underply crossways, and the phenolic surfaced 6mm ply up and down on top of that, screwed through to pick up the plate, not the 50mm bearers underneath. This is the finished article with the steel 2.5mm toeplate added. 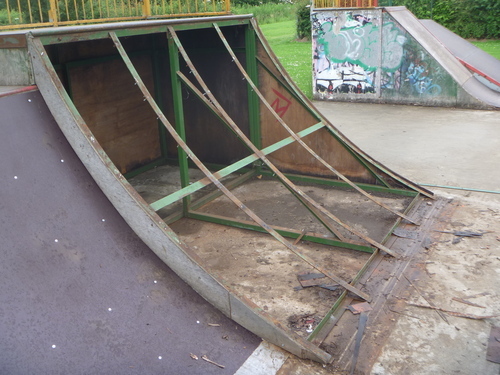 note that the surface ply is now flush with the concrete, but because we know that the steel is directly behind it, we can screw the toeplate through to the steel, and there is now no need for fixing to the concrete. 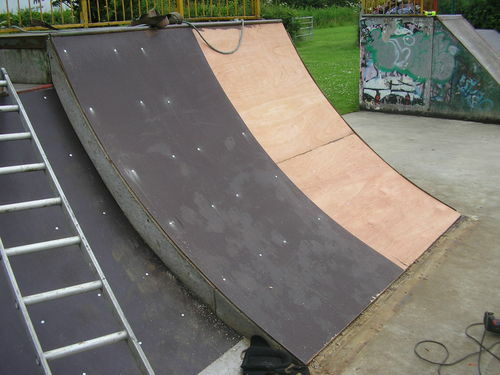 This ramp the has 50mm x 3mm rails to protect the edges.